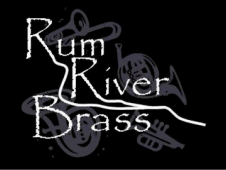 The Rum River Brass is a quintet consisting of experienced players from the northern part of the Twin Cities. They play an eclectic repertoire, including jazz, classical transcriptions, ragtime, pop, Dixieland - in short, just about anything! The band plays at weddings, corporate functions and appears regularly at concerts-in-the-park in many local cities. The Rum River Brass were featured at the 2011 Bloomington Jazz Festival. ​a great fit for our [graduation] ceremony." I recommend the Rum River Brass to anyone that asks." and fit perfectly into whatever our choirs are doing. [Ours] is a happy and cherished relationship." "Thank you for helping make our Family Music Night a big success! Your playing sounded great and the little instrument demos were perfect." "Thank you all for making my [wedding] day so wonderful! looking for a brass quintet for a wedding or any other special event." generated by this ensemble. They are superb musicians!" Rum River Brass featured on ABC Newspaper's "Hometown Sound"! Click to visit page and view video.